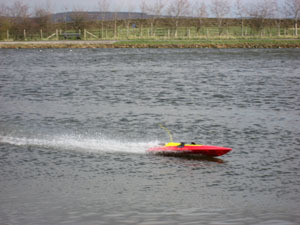 Power boats are sailed on Redcar Tarn by KDMES members. The best time to visit is Saturday afternoon, when club members usually meet. The boats are launched from a purpose built landing stage on the Keighley side of the Tarn. As the lake is not used for drinking water then craft powered by electric, steam and internal combustion engines are sailed here. 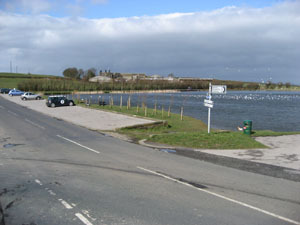 Redcar Tarn can be found on Black Hill Lane on the road from Keighley to Whitley Head. There is free parking next to the road, and the lake has a path round the edge, so even if there is no one sailing you can still have a pleasant walk. 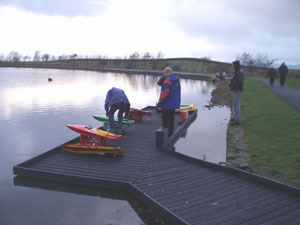 The sailing of model craft on Redcar Tarn is governed by Bradford Metropolitan District Council. Boats powered by wind, steam, or electric may be sailed by anyone at anytime. Craft powered by an internal combustion engine are subject to strict regulations laid down by BMDC. Click here for a document covering the regulations. This page was last updated on Sunday 23rd March at 19:00.